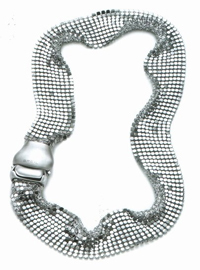 Breil Steel Silk is a necklace and soft as silk with a mesh of thin steel all glittering necessary can be transformed by changing its appearance, becoming tubular, a closure that plays with the rest of the series, presenting with matt or glossy, in contrast with the plot of the mesh. In the collection there is also the bracelet in one and the same glossy closure Bilux. Laura Chiatti and Nicolas Vaporidis. Two successful actors returning to promote a product Breil after some time. A short film which is set against the unique charm of a city like Rome, where the two well-known actors show their skill with a game seduction. Breil Steel Silk confirms the brand’s philosophy in Milan create jewelry multindosso as evidenced by the recently launched other jewelry. Successful jewelry that can be worn with great ease, suitable for every situation, casual and elegant at the same time aiming to be a real status symbol.